The month of June flew by, and here we are, just days away from the 4th of July! 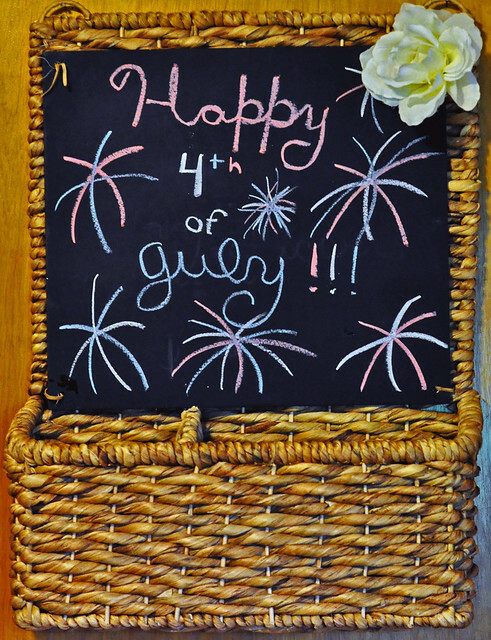 Since we LOVE the 4th of July, the kids and I have been busy celebrating and preparing for the big day! 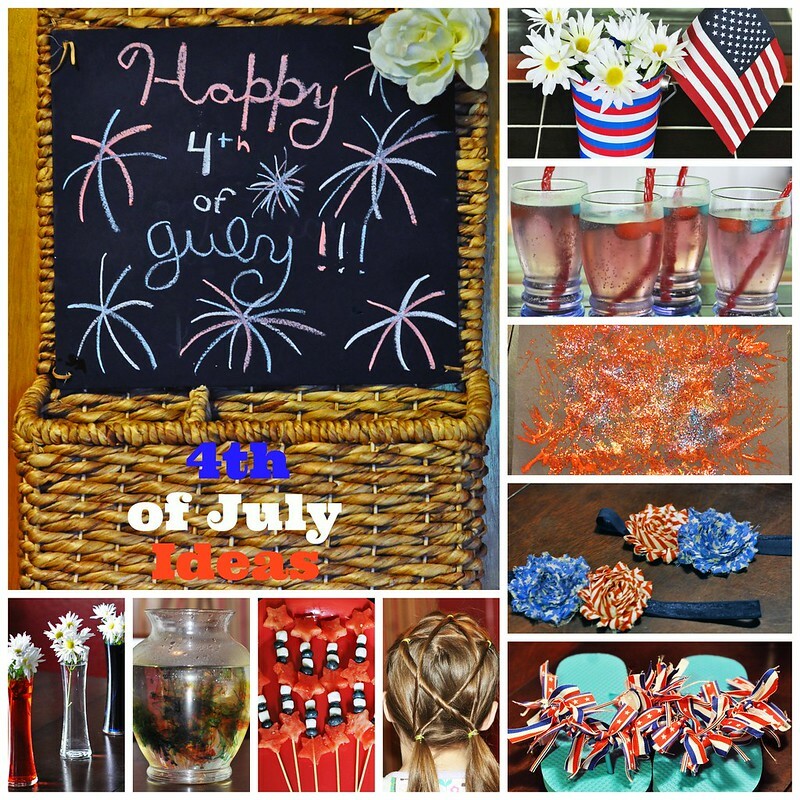 I put together a list of a few of our favorite 4th of July-themed ideas. 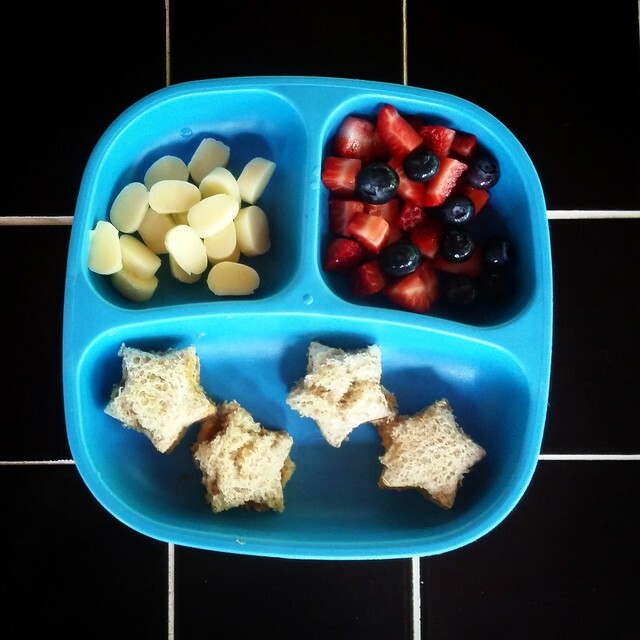 Although the food is yummy, the kids love the very last idea the most! Dylan and Lily are obsessed with these! They've been eating them all week! I cut up the watermelon at the beginning of the week, and stored all the extra stars in a big bowl in the fridge. 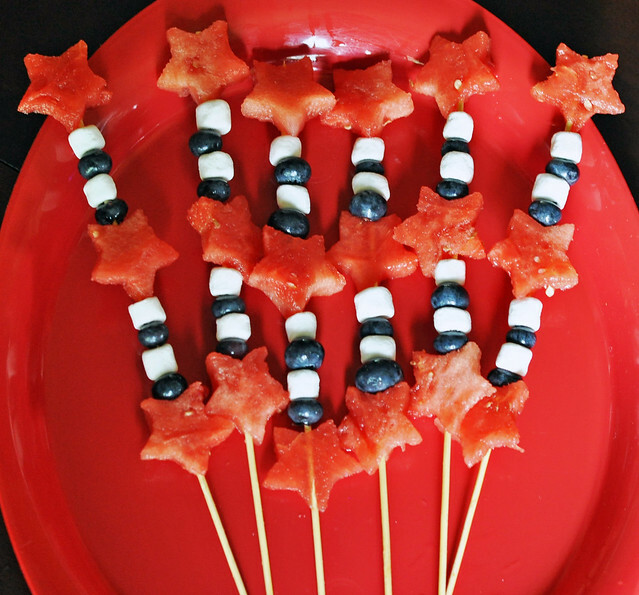 To make the stars, just slice the watermelon into thin slices, then use a cookie cutter to cut out the shapes. 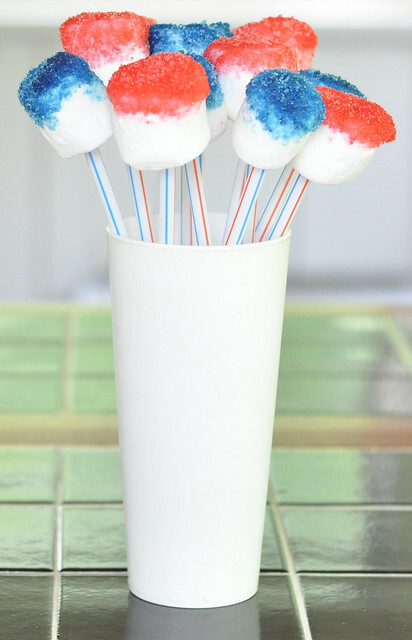 Put them on a skewer along with blueberries and mini marshmallows. These didn't turn out as pretty as they normally do (I blame the generic white chocolate chips! ), but they were REALLY good. We made 24, and between 2 adults, and 5 kids, they didn't even last 24 hours! We make these for every holiday because they're so easy. Just melt white chocolate chips in the microwave, stir, then divide into 3 bowls. 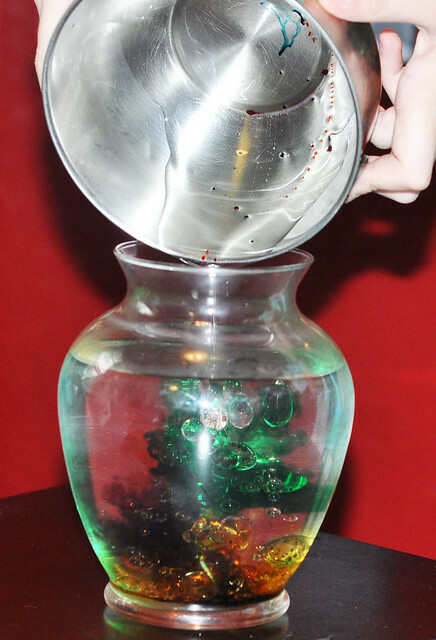 Add red food coloring to one bowl, blue food coloring to another, and leave the third bowl white. 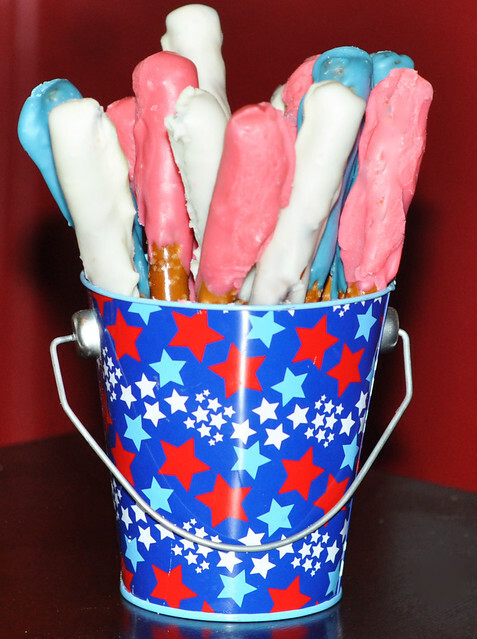 Dip half of the pretzel rod into one bowl of chocolate, then place on wax paper to dry. You can add sprinkles or colored sugar, but we opted not to this time! Liam FINALLY stopped tossing his dishes and utensils off his highchair tray! I was so excited to be able to use our Re-Play plates. (Check out the link! We LOVE them!) 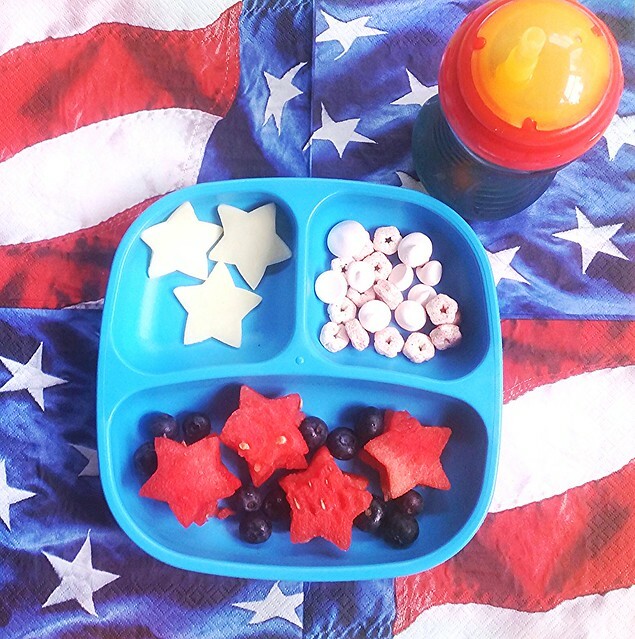 I started using them yesterday, and fed Liam a few 4th of July themed meals! The older kids were jealous and want their own Re-Play plates now! Freeze red juice and blue juice (or Kool-Aid) in ice cube trays. Fill a cup with Sprite or ginger ale and add the frozen cubes. Cut the ends off a red Twizzler and use it like a straw! OR just keep it easy for the kids and buy red and blue Kool-Aid Bursts. 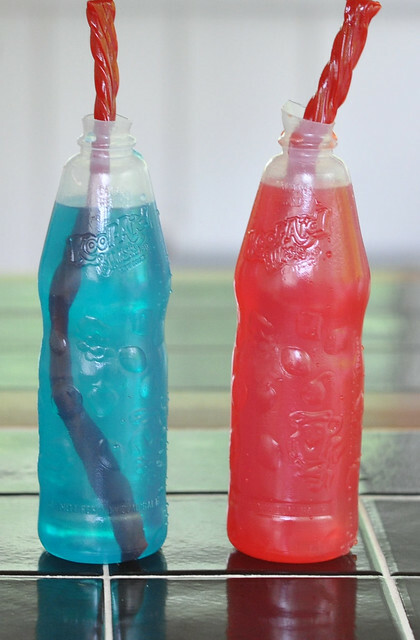 Cut the tops off and put in a Twizzler straw! I'm going to be honest. I didn't do much this year! I put wreaths on the doors, and put a few flags in outdoor plants on our porch and in our yard. 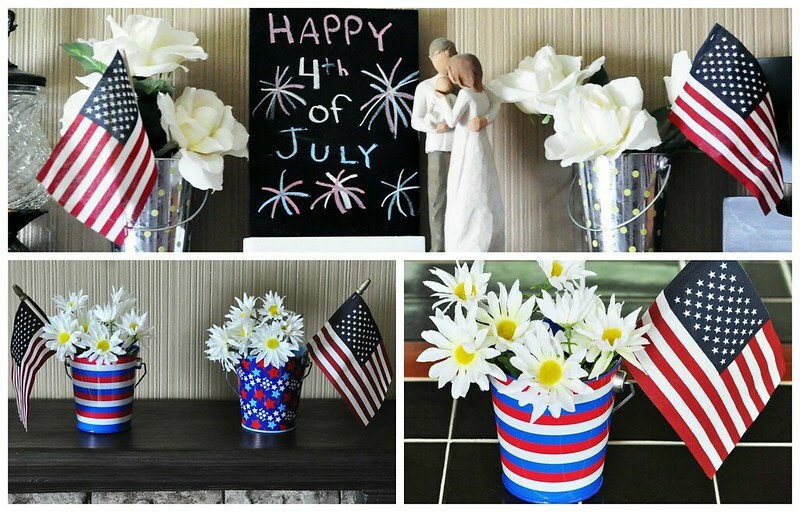 I wrote on the chalkboards, put some flowers in mini patriotic pails, and added a few mini flags to the all the pails and vases in my house. 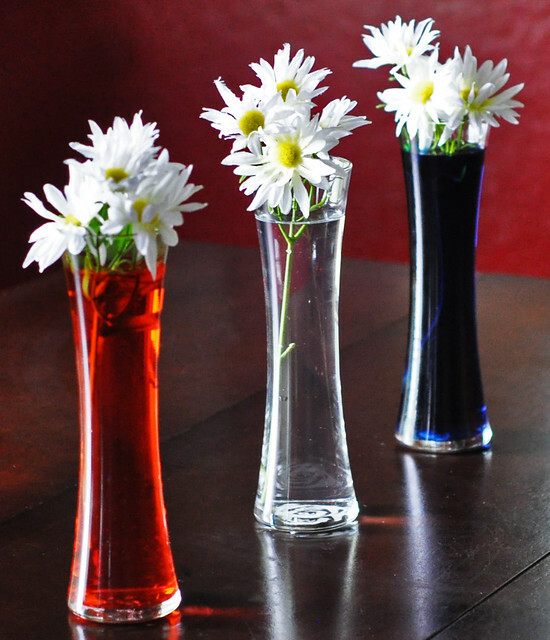 I did borrow my friend's idea of coloring the water in vases with red and blue food coloring (she does this for every holiday). It's so simple, and I love it! 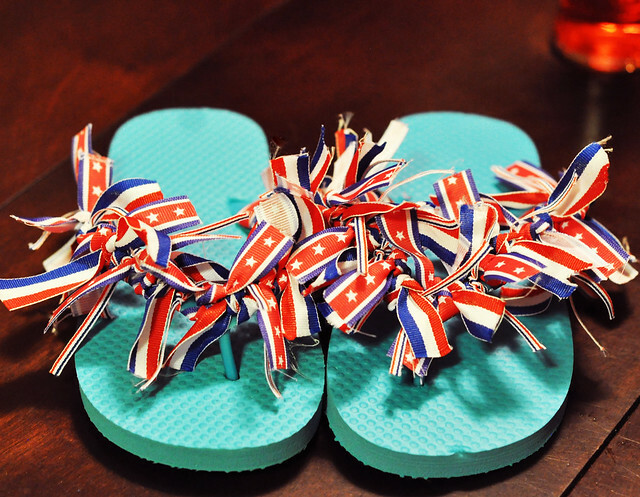 The girls needed new ribbon flipflops for the 4th. I managed to finish Lexie's, but I burned my hand yesterday, and couldn't finish Lily's. I'm going to try to finish them by Saturday! I've been making fancy flipflops since Lexie was 3. I started with balloon flipflops, then moved on to ribbon flipflops. They're SO easy to make! I always buy 3 different styles of ribbon. Cut the ribbon to a 6 inch length, then double-knot each strip of ribbon around the flipflop. 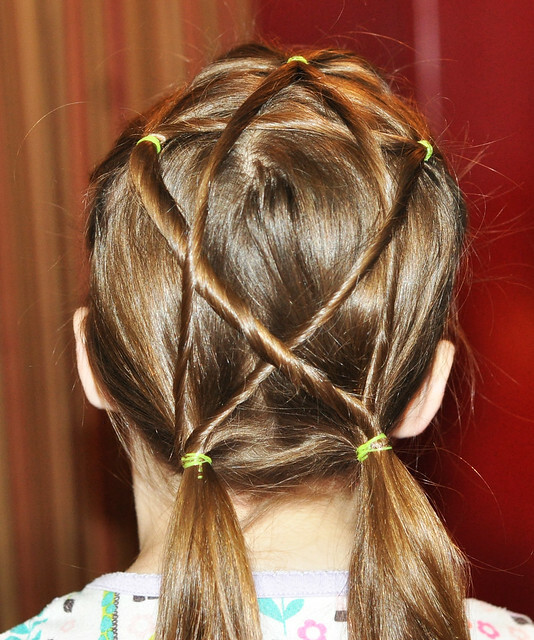 Tie the knot on top and use an alternating pattern. Trim excess ribbon when you're done. I know some people use clear nail polish on the ends of the ribbon to keep them from fraying, but the flipflops get so dirty that it's hard to reuse them anyway. It's best just to buy a pair for less than a dollar the following year and remake them! This is another easy DIY! I buy the shabby flowers and elastic headbands from The Hairbow Company, then quickly stitch the flowers onto the elastic headband. I made 2 headbands in less than 10 minutes! Dylan kept it simple, but added a few personal touches! And Lexie piled on the glitter! We used forks and toilet paper tubes (with the end cut into strips) for the brushes. A quick Google image search will give you many more ideas! This one was actually from a list of hairstyle ideas I bookmarked a long time ago. I recently saw it on Pinterest while I was searching for birthday party ideas, so I decided to give it a try. It's really cute and not difficult to do! 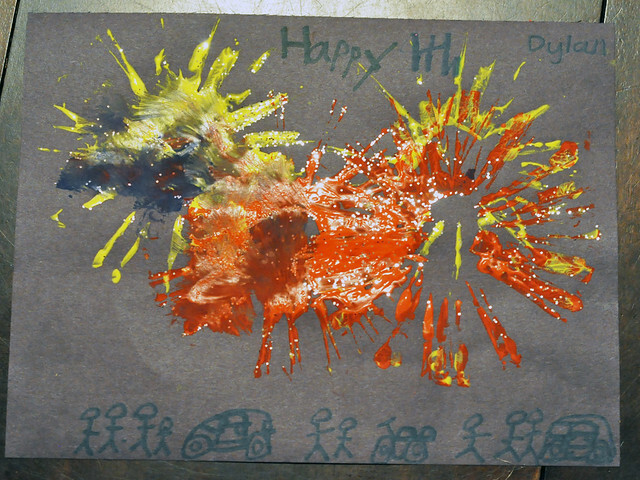 Dylan did this in school a few years ago. He brought home a paper with the instructions, but I filed it away and never thought about it again. This was another thing that popped up in my Pinterest feed while searching for party ideas, so I decided to find the paper and give it a try! 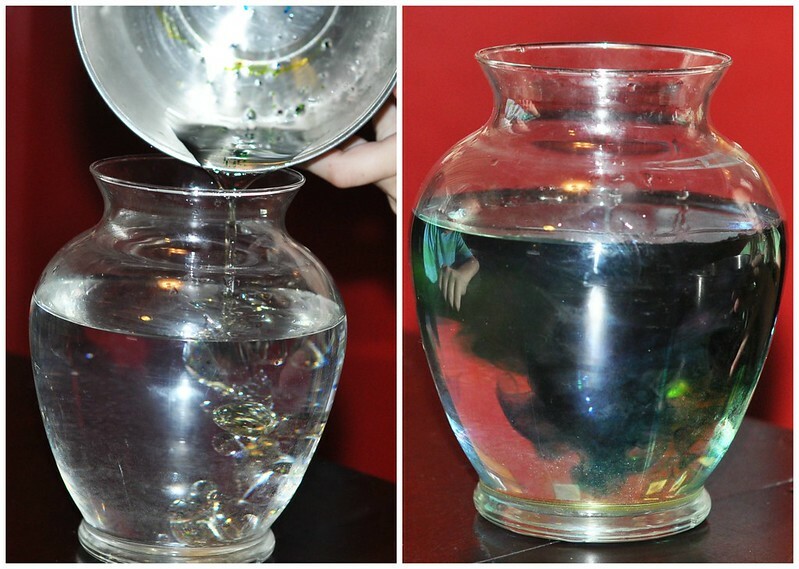 Just fill a large jar (or cup) almost to the top with water. In a separate small bowl, add 2-4 tbsp of oil (just enough to cover the bottom). Use 4 different colors of food coloring. 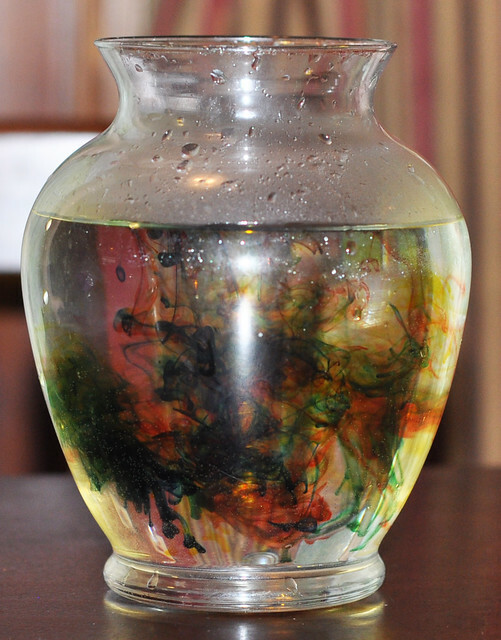 Add 3 drops of each color to the oil. 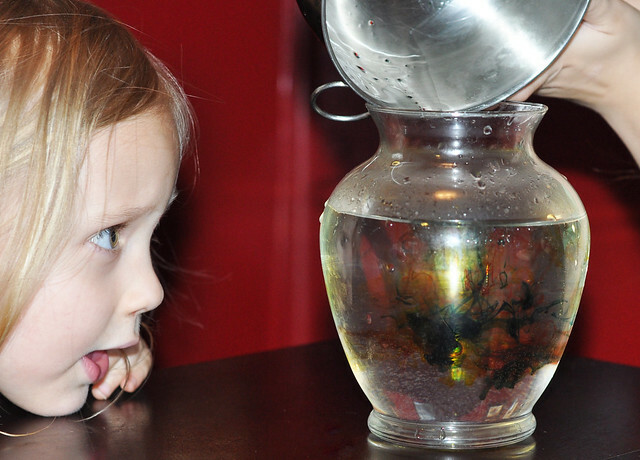 Use a fork to gently smash the drops of food coloring so that each drop separates into smaller drops. 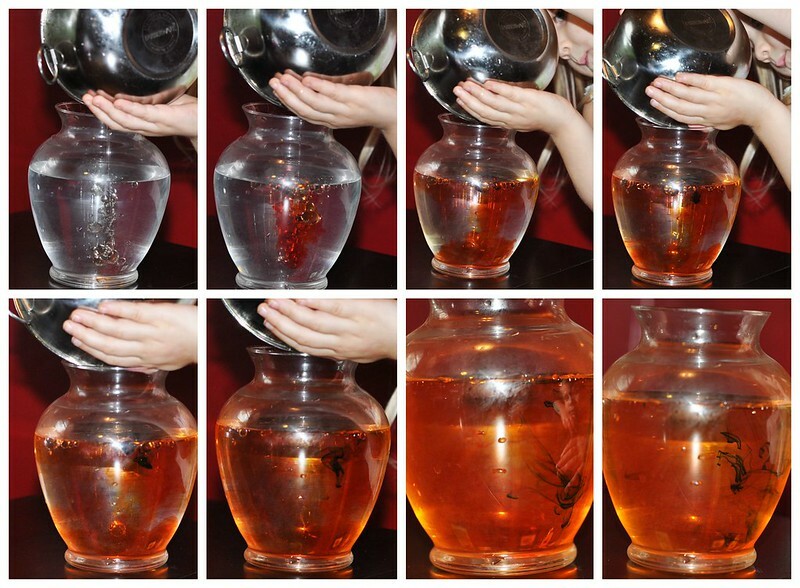 Now S-L-O-W-L-Y pour the oil mixture into the water. If you dump it in, it will blend really fast. The slower you go, the longer it takes to mix, and the better it looks! It was so simple, but SO captivating. The kids did it over and over and over again! We are ready for the 4th! We'll be celebrating all weekend! Our annual picnic is on the 4th along with a parade and fireworks, and we have a birthday party and another picnic on Sunday. We're looking forward to a fun weekend with our family and friends! I hope you all have a fun, safe weekend! Linking up for The Monthly Meetup! Happy 4th of July! I just made a few more fruit kabobs. The kids love them! The Willow Tree ornament was a gift from a sweet friend when Liam was born. It has been on my mantle ever since! All such great ideas!! I especially love that star hairstyle! I saw that on Pinterest the other day and I so wish that Olivia had enough hair to do it. Next year she should, for sure! So much fun! What a great roundup of ideas! Pinning now! Thank you, Sara! Have a great weekend! 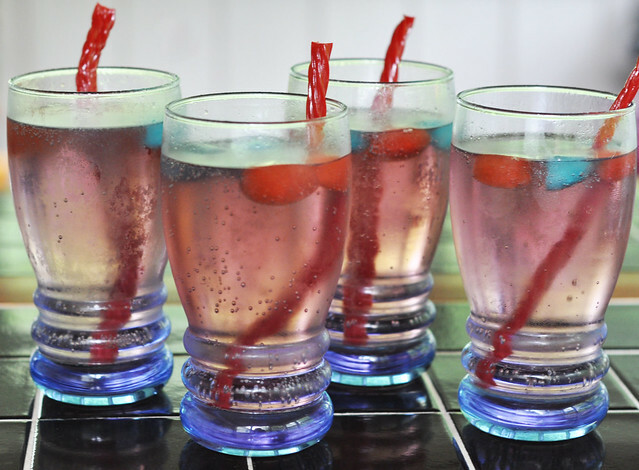 I've done the red/blue ice cubes in Sprite or Ginger Ale before- We didn't use licorice straws though. The family loved it. My favorite fun idea though is to make cupcakes and mix Pop Rocks candy into the icing!! Fireworks cake! Pop rocks are hard to find but I've found them at the Dollar Tree! I really wanted to make the Fireworks cookies, but couldn't find Pop Rocks. Thank you so much for the tip! I will have to check there! That hairstyle is so cute! 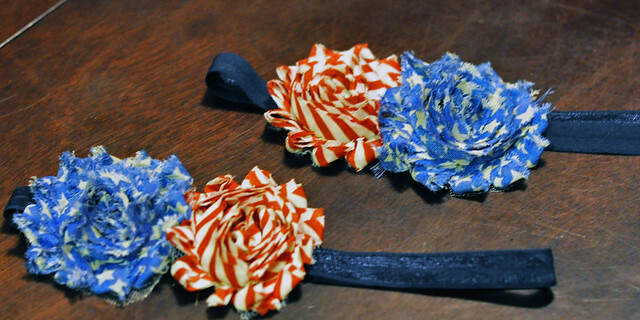 It would be awesome with red white and blue ponytail holders! (Am I too old to try that?? Haha.) Have a great holiday. Thank you! I agree on the ponytail holders! XOXO Hope you had a great weekend! Whoa - lots of cool stuff! My kids are at my parents many days this summer - I'll have to share this post with my mom b/c she's always finding neat stuff for them to do! Hey, girl! Thanks so much for linking up with us for The Monthly Meet Up! You rock!